THE GLOBAL LEADER IN T I S S U E The Power of Leadership Since 1976, Convermat has been the leading global supplier of parent rolls of tissue to more than 80 countries worldwide. Our unparalleled market intel and strong network of strategic alliances, resources, and insider knowledge can further grow and strengthen your business to achieve higher profits. There When You Need Us We consistently maintain capacity balance for many of the leading global tissue players. Our extensive network of global suppliers and customers enables us to deliver a continuous flow of tissue at the most competitive prices in any market condition and to any destination with speed, reliability, and integrity. At Your Service Our experienced team of seasoned professionals is equipped to handle all of your needs including inland and ocean transportation, import/export protocol, technical specifications, testing lab facilities, proprietary product development, foreign currency management, credit risk, and all relevant sales services. More Than Tissue In addition to our complete line of tissue, towel, napkins, and specialty paper we supply a comprehensive line of nonwoven substrates for medical, wipes, automotive, filtration, hygiene applications, and more. Industry 4.0 is underway... we look forward to Industry 5.0. China’s economic slowdown and new green regime is rippling across the world. More than 1,000 smaller pulp and paper mills have closed in China in five years, and more are set to follow. Industry analyst Simon Creasey assesses how these seismic changes will affect the West. The latest news impacting your market from across the global tissue industry. A post-nuclear future … France faces its electric power generation dilemma. By Fisher International. Retail tissue: finding pockets of growth in a highly mature market. By Euromonitor International. WEPA plans for vive la difference in the French market. WEPA France is investing while some competitors are selling or restructuring. Country Manager Christophe Dorin spoke to TWM. World News: 06 “We have successfully realised a dream," Walter Schalka, Suzano chief executive, following the merger of Suzano Pulp and Paper with Fibria. Niche tissue… independence, recycled paper, rapid response, flexibility, personalised and increasingly green products. Director general Emmanuel Coulon explains his smart circular economy concept at his Normandy mill. Alexandra Stuthridge, technical business manager at The University of British Columbia, talks about her retail preferences at home and on her travels. 2019 will be rich in projects to find the leading edge. In terms of optimal maintenance and process, analysing what the machines are telling us gives enormous added-value. TWM asked the world’s leading converting machinery suppliers – Fabio Perini, Futura, Gambini, ICM, Maflex, MTorres and PCMC – to explain their latest advances. Tissue delivery trends. By Pirkko Petäjä, principal, Pöyry Management Consulting. Logistics of the future: how the world of supply chain management is changing. By Vittorio Cavirani, general manager, Elettric80. Smart factory robotics and automation has come to the rescue. By Paul W. Hill, business development manager, Reko Automation Division. YOUR EXPERT SERVICE IN ONE WORD, ALL TOSCOTEC SERVICES. YES: the Toscotec division created to follow customersâ&#x20AC;&#x2122; demands on a daily basis, offering them remote and on-site assistance for all maintenance needs and good operation of their plants. In order to have a continuative assistance anywhere in the world there is YES - 24: this service puts a Toscotec technician at your disposal 24/7. Moreover, in order to stay always connected with the team there is YES - CONNECT-VISION: the device for remote assistance with which Toscotec experts can visually connect with the plant at all times and guide the operators to promptly solve the problem. YES - BURNERS YES - YANKEE HOOD & ENERGY RECOVERY SYSTEM YES - PLANT OPTIMIZATION YES - GENERAL MAINTENANCE YOUR NEEDS, OUR SOLUTIONS. French customers are turning to green products There are several words for ‘Smart’ in French … the ones we prefer are élégant, or intelligent. Our Country Report on France finds that élégant tissue production is well underway, with the added element of style which would be expected. In a mature, saturated market struggling for organic growth, encouraging green shoots are appearing as more consumers are getting behind environmentally-friendly products. The emphasis is on niche tissue categories, independence, recycled paper, rapid response, flexibility, personalised and increasingly sustainable products. We spoke to Christophe Dorin, WEPA France country manager, and French manufacturer Papeco director general Emmanuel Coulon… who explained his concept of the élégant ‘circular economy’ at his Normandy mill. Fisher International also looks at one looming decision facing the whole country. With the government committed to eliminating nuclear plant produced electricity long-term, how will the mills of the future cover energy sources and costs? 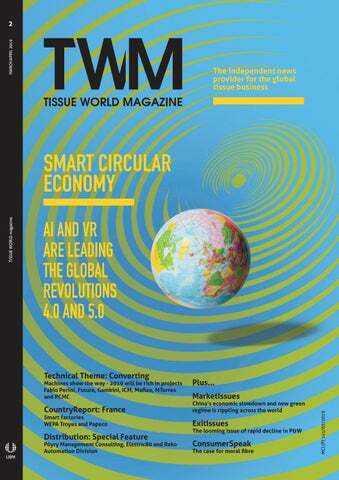 info@tissueworld.com Subscription online at www.tissueworldmagazine.com In Tissue World all measures are metric and all dollars ($) are US dollars, unless otherwise stated. Copyright 2005 – 2018 by UBM Exhibition Singapore Pte Ltd. All rights reserved. All materials printed in Tissue World magazine is owned by UBM Exhibition Singapore Pte Ltd and protected under the copyright act. No material may be reproduced in part or in whole without the prior written consent of UBM Exhibition Singapore Pte Ltd.
Our new TWM design looks… well, smart, I’m sure you’ll agree. 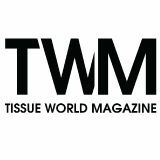 It will be making its debut at our Tissue World Milan 2019 trade show and conference – the flagship show of Tissue World. With over 200 exhibiting companies, more than 3,000 tissue industry professionals, and our Smart and Sustainable – Strategies to Stay Sharp as a New Decade Dawns conference, we at Tissue World look forward to seeing you there. CHINA’S ECONOMIC SLOWDOWN AND NEW GREEN REGIME IS RIPPLING ACROSS THE WORLD More than 1,000 smaller pulp and paper mills have closed in China in five years, and more are set to follow. Simon Creasey assesses how these seismic changes will affect the West. impacting local communities and the billions of people around the world who use products made from our pulp every day.” The company told TWM that: “Suzano, the combined company after the merger between Suzano Papel e Celulose and Fibria, will maintain unchanged the production of the 11 plants currently in operation on the two companies." As to whether any staff have been made redundant, Suzano said: "Occasional adjustments involving the relocation of employees between units or lay-offs have been done." Suzano declined to comment on the number of redundancies made. was launched. It is expected to generate annual cost savings of approximately SEK900m, with full effect at the end of 2019. The program is proceeding as planned and for the fourth quarter of 2018, cost savings amounted to SEK18m. At the end of 2018, the annual rate amounted to about SEK150m; •	To strengthen competitiveness and increase efficiency the company made changes to its organisational structure and Executive Management Team. The group said the European and North American retail markets showed “good growth” but with a continued high level of competition while emerging markets noted higher demand. The European market for consumer tissue demonstrated low growth while the Chinese consumer tissue market noted higher demand. Emtec announces TSA upgrade Emtec Electronic has responded to customer demand and upgraded its Tissue Softness Analyser (TSA). With the updated device and an advanced measuring method it is now possible to evaluate the impact of different fibre mix ratios by measuring handsheets to predict the softness quality of the finished tissue product. According to the supplier, the original TSA represents “a nearly perfect simulation” of the human hand, and shows “excellent results” in measuring base tissue and finished tissue products such as toilet paper, handkerchief and facial tissue. Before the upgrade, the device had been limited in measuring the impact of different fibre compositions of long and short fibres. Emtec – which developed the TSA – added that the upgraded version has a new sensor design that enables the new softness measuring method for handsheets to have more accurate and reliable results. The supplier said the new measuring method opens up possibilities for saving costs and resources, and leads to an efficiency increase in the process and product optimisation. •	Coagulants: 10 - 15% •	Flocculants: 10 - 20% •	Defoamers: 5 - 15% •	Biocides: 5 - 15% •	Alkaline cleaners: 10 - 20% In addition to product price increases, Buckman will implement freight delivery increases in certain regions as required. EUROPE K-C to call off European tissue sale following reports of its potential sale; Financial Times reports Kimberly-Clark (K-C) is understood to have called off its plans to sell its European tissue unit, according to the Financial Times. It follows reports during 2018 that the tissue giant was looking to sell the unit to private equity groups. However, the FT reported that the unit has fetched far lower than the $1.2bn asking price. It was put up for sale last year by the New York-listed company as it seeks to reduce costs and dispose of less profitable businesses. Besides Andrex in the UK and Ireland, brands in the company’s European business include Hakle in Austria and Switzerland, and Scottex in Belgium, Italy and Spain. K-C declined to comment. THE STICKING POWER OF WATER. Futura is revolutionising toilet roll production with JOI Hydro-bond technology, heralding the era of bonding without glue. The solution to combine the unique performance of the JOI embosser withÂ pulp fibres and water. + SPEED: increased output. + CLEANING: less contamination on the machine. + SAFETY: fire risks are eliminated. + SAVINGS: the need for glue is reduced to a minimum. + SUSTAINABILITY: the product is more environmentally friendly. + QUALITY: the paper is more hygienic for the consumer. COME AND TRY YOUR PAPER AT FUTURA LAB. and cooking paper business of Metsä Group, while Petri Helsky, who was the chief executive of Metsä Tissue Corporation since 2015, left the company. Elsewhere, Metsä Tissue is also considering options for the sale of its napkin business in at its Stotzheim mill in Germany. The company manufactures napkin tissue and finished goods at the plant. Zeiler said: “The Napkin market suffers from an unprecedented cost inflation. The site in EuskirchenStotzheim is also affected by this. “All alternatives, including the short-term increase in profitability, divestment or closure, will be investigated.” The Stotzheim mill has a long history of serving leading German and European retailers and wholesalers. Metsä Tissue is one of the biggest suppliers in this segment in Germany. The company has also announced changes in responsibilities in Metsä Tissue’s mills in Stotzheim and Raubach. Markus Claassen has been appointed vice president, napkins, to the Stotzheim mill. Claassen was previously mill manager at the Raubach mill. Wilfried Schröder, current vice president, napkins at the Stotzheim mill, will support Claassen during the introduction period before he will leave the company. Dirk Hamann has been appointed mill manager to the Raubach mill. ARGENTINA CMPC boosts presence in Latin America with start-up CMPC Tissue Latam group’s Papelera del Plata plant has fired up a TT SYD-12FT. Supplied by Toscotec, it is installed on PM3 at the company’s Zarate mill in Argentina. It replaces an existing Steel Yankee dryer that was supplied by another manufacturer. The TT SYD-12FT features a diameter of 3.6m and a width of 2.8m. The scope of supply includes Toscotec’s patented deckle insulation system, which allows for safe and practical application of the deckle insulation on the Yankee’s heads without any machining, the drive group, support and bearings, and the main components of the steam and condensate system. CMPC is one of the largest pulp and paper producer in Latin America, with industrial operations in eight countries. Its products range from wood products, pulp, packaging paper and tissue and are marketed in 45 countries worldwide. The company uses fibres originating from sustainable, certified plantations and recycled materials, and has an annual tissue capacity of 700,000 tonnes. With the TAD+® Coating Package from Buckman, the benefits keep adding up. More definition. More softness. More value in every run. The TAD+ coating package from Buckman features a unique coating matrix that works with your TAD, NTT, and ATMOS technologies to extrude fiber from deep in the structured fabric, promoting deeper pockets, greater definition and extra softness. It gives you a cleaner transfer with minimum distortion. And because it allows you to transfer at higher moisture levels, your mill can save energy and speed production all year long. And that can be a real plus for your mill’s profitability! Learn more. Find out all the ways TAD+ can add to your tissue making success. Contact your Buckman representative or visit buckman.com. © 2019 Buckman Laboratories International, Inc. All rights reserved. Kemira is to establish a joint venture – Kemira Yongsan Chemicals (NewCo) - in Ulsan, Republic of Korea, with Yongsan Chemicals, a South Korean privately-owned chemicals company. The company said the move was an important step in expanding its presence in the Asia Pacific region. NewCo will produce dry polyacrylamide (DPAM), cationic monomer Q9 (AMD) and other chemicals that are used for retention and drainage in packaging and paper production, as well as in wastewater treatment and in sludge dewatering. Nichlas Kavander, senior vice president, pulp & paper, Asia-Pacific, said: “The joint venture accelerates our strategy and strengthens our position as a leading global polymer producer. “It supports Kemira’s future growth, especially in Asia pacific region by providing additional polymer capacity, securing our capacity utilisation and supporting our customers better with our global delivery capability.” Kemira will make a multi-million investment in the joint venture and will have 35% minority share of the established company. PartexTissue boosts capacity with investment PartexTissue has invested in an iDEAL forged YD: another new-generation Yankee. Supplied by A.Celli Group, the latest generation Yankee is part of a complete turnkey plant project, consisting of an iDEAL-1800 Tissue Machine, a E-WIND T100 rewinder with three unwinders and the A.Celli R-WAY roll handling system. The supplier said the iDEAL forged YD has been created using new patented technology that involves the production of the dryer cylinder shell starting from a single piece of steel shaped and worked with forging and hot rolling systems. conveyors for tissue rolls that come from the new rewinder and tissue machine, as well as a fully automatic axial wrapping machine that wraps rolls of every different size with an automatic feeding system. Established in 1573, Klippans Bruk produces over 40,000tpy of premium tissue. famous brand. Soundview president and chief executive Rob Baron said: “The fire resulted in catastrophic damage to our facility. “We don’t yet know what the future will be for Marcal; we do know that our operations in New Jersey have been devastated, resulting in the loss of employment for many of our dedicated colleagues, some of whom have given decades of service to our company.” Efforts are now underway to help the employees: “The dedicated colleagues who lost their jobs due to the fire at our mill remain our top priority.” The company has been engaged around the clock with the Governor’s office, the New Jersey Department of Labour, the New Jersey Department of Human Services, Congressman William Pascrell, local officials and neighbouring non-profits to identify and secure support for its people. A job fair was held on 8 February and it has also launched a new website page for its people to learn of hundreds of job opportunities at local businesses, as well as at companies owned by its parent company Atlas Holdings around the country. Baron added: “Select aspects of the Soundview Paper Company/Marcal business will continue, primarily the company’s Putney, Vermont operation and shipping of existing inventory to customers from Elmwood Park. “We are increasing operations at our Vermont location, allowing us to support the iconic Marcal brand in the AfH and Home and Office markets and we are hard at work on plans to continue to bring the Marcal-branded bath tissue, paper towel and napkin products to your grocer’s shelf. “Over the last five days, we have witnessed overwhelming support for Marcal and its people from our friends in the local community, throughout the State of New Jersey and beyond. “We have been reminded what the Marcal sign has meant to so many; that this company was not only a trusted employer and an iconic business, but a symbol of New Jersey’s historic manufacturing legacy. “We are appreciative for the outpouring of love and support which sustain all of us through this very difficult time.” The 1930s-era mill was acquired by Atlas Holdings in 2012 and the company then established Soundview Paper to manufacture recycled and virgin fibre towel and tissue products for the local AfH, private label and At-Home markets. Metsä Tissue has invested in its Mänttä mill after signing up Valmet to supply automation for the site’s liquefied natural gas delivery. Valmet will supply an automation system update and expansion for Nordic energy company Gasum's project at the plant. It will see the mill replace liquefied petroleum gas with Gasum's low-emission liquefied natural gas in the burners of the drying processes on its tissue machines. The system renewal will be delivered in June 2019. Valmet's automation system will be used to control the burners of the drying processes and manage a gas terminal that will be connected to Valmet's data collection application. The supplier said the delivery will standardise and optimise the tissue drying process and quality management. Valmet's delivery includes automation controls with DNA Modbus links to the burner and gas terminal PLCs as well as necessary DNA I/O expansions on the tissue machine automation systems. The delivery also includes DNA software updates and expansions in the process air systems and drying power control systems of the tissue machines. Gasum will carry out the modifications needed for the fuel switch as well as all equipment installation. Global Hygiène is to increase its production capacity after signing for a complete turnkey tissue production plant. Supplied by A.Celli Paper, the investment will take place at its Charavines plant. The new iDEAL1800S machine will have a 2.8m width and an operating speed of 1,800mpm. The project also includes an E-WIND T100 rewinder and a R-WAY® rollhandling system. Luc Brami, chief executive of Global Hygiène, said that the production of Charavines is estimated at 30,000tpy and will cover the needs of the two Global Hygiène group’s converting plants, in Auxonne and Vern d'Anjou. Delivery is expected for the fourth quarter of 2019. September, TM3 and TM4 (with a 16’ Yankee) and TM5 (with 18’ Yankee) have also been started-up. With the investment, Yibin Paper aims to be China’s largest bamboo pulp tissue paper producer. The company also owns a bamboo pulp factory and its goal was to produce tissue paper without adding wood pulp from the beginning of the project. The whole design of the plant, from stock preparation, to approach flow system and to tissue machine, was based on the use of 100% bamboo slush pulp. THAILAND Berli Jucker Cellox boosts production of high quality tissue paper with investment Berli Jucker Cellox has increased its tissue capacity after purchasing an E-WIND T100 rewinder. Supplied by A.Celli Paper, the line will be installed at the company’s Prachinburibased plant. It will be used to produce all types of high quality tissue paper, weighing from 13 to 45gsml. It is equipped with three unwinders and a calendar, with a maximum operating speed of 1,900mpm and a maximum diameter of the finished roll of 1.8m. but otherwise similar to the rest of western Europe. This indicates that there is room for France’s tissue business to grow organically despite the prolonged population growth if supported by product use habits and the overall economy. DESPITE BEING A MAJOR ECONOMIC POWER IN EUROPE, FRANCE HAS NOT ENJOYED THE STRONG, EXPORT-DRIVEN ECONOMY THAT COUNTRIES SUCH AS GERMANY – WHICH IS THE CONTINENT’S LARGEST NATIONAL ECONOMY - HAS. ITS POPULATION GROWTH HAS BEEN NOTICEABLY FLAT. POPULATION GROWTH EXPRESSED AS CUMULATIVE AVERAGE GROWTH RATE (CAGR) FROM 2012 TO 2018 WAS 0.5% COMPARED TO 1% FOR A SIMILAR PERIOD IN GERMANY. expressing frustration with the economic factors of unemployment and consumer price inflation. The net results are unclear at this point. Fibre prices, exchange rates and environmental regulations will change, giving some participants advantages and others difficulties; tissue companies will continue to change hands and perhaps consolidate; neighbouring countries may invest in tissue making capacity, affecting France’s imports; consumer preferences will continue to evolve, making TAD either more critical or less – and future pulp and energy prices will change TAD adoption, too. +0.4% in 2018. Population projections for the next five years through 2023 show a similar trend, with year-on-year growth of 0.3-0.4%. As a direct consequence of the factors previously mentioned, the unmet market potential, ie the extent to which the retail tissue market could grow in the country in the future, remains limited. According to Euromonitor International estimates, opportunities for incremental consumer tissue sales in France stand at USD375 million, or about 81,000 tonnes in volume. By comparison, some other countries in the region might offer more room for growth, with estimated potential of USD634 and 189,000 tonnes in Germany and estimated USD573 million and 178,000 tonnes in Italy. sales of retail tissue in the country. Indeed, GDP per capita amounted to USD42,267 in 2018 and is set to grow at an average annual rate of 1.6% in the forecast period, to reach USD46,008 in 2023. Additionally, the unemployment rate is projected to decrease by 5.5% between 2018 and 2023. Those factors can create additional room for manoeuvre and entice French consumers into buying premium quality tissue products with added-value features and at a higher price point. Moist toilet wipes hold some growth potential Some retail tissue categories are projected to be somewhat more dynamic than others, such as for instance, moist toilet wipes. The category is indeed set to register a 20% volume CAGR in the next five years. Lotus has been aiming to disrupt a once lethargic niche occupied by a few modest local players. Since the launch in 2016, Lotus moist toilet paper has revitalised the category, which is positioned as complementary to dry toilet paper and boasts elements of sustainability positioning. The importance of integrating sustainability into innovation and go-to-market strategies In recent years, French consumers have increasingly paid attention to consumer product composition and ingredients, the provenance of materials, as well as the impact of the paper industry on the environment. Consequently, to differentiate themselves and have a positive brand image, tissue players have a growing interest in communicating environmental issues and developing products positioned as more eco-friendly. Integrating sustainability into key strategies and communicating will become even more important to both consumers and the industry. Euromonitor consumer surveys conducted in 2017 indicated that 37% of French consumers considered “environmentally/ethically conscious” an influential product feature in household essentials, and 22% of respondents indicated a willingness to pay more for products positioned as “environmentally/ ethically conscious”, indicative of opportunities for the industry to drive innovation and consumer communication in environmentally friendly tissue products. The latest innovations in sustainable products include a new private label line from Casino, the fifth largest grocery retailer in France. In late-2017 the retailer introduced a new product under its “La Bonne Idée!” private label line – a toilet paper without a tube. The traditional cardboard tube is replaced by a smaller toilet paper roll. Similarly, at the beginning of 2018, Lotus eliminated cardboard tubes from its new Moltonel products. According to Essity, this innovation reduces waste – both in terms of tube and packaging – by 60%, and CO2 emissions by 5%. In addition to product innovation, tissue players are increasingly set to communicate on sustainability. FSC-certification is likely to be increasingly emphasised, whether it is on companies’ websites or directly on the product packaging. penetration, which put additional pressure on pricing. However, despite saturation and commoditisation of consumer tissue, many French consumers are willing to embrace innovation if it is meaningful and adds tangible value to the products and their experience with the products. The latter will become even more important as price increases in Western Europe will likely gain momentum in the coming years. Sustainability in all its forms is one path that can help product manufacturers to stand out and drive value, especially in view of some consumers’ willingness to pay more for such products. From sustainable manufacturing practices to meaningful changes to product attributes, including fibre sourcing, the “green” trend creates opportunities for product differentiation and higher price points in consumer tissue. These need to come with relevant consumer communication strategies to convey product benefits and thus to attract and retain consumers. WEPA PLANS FOR VIVE LA DIFFERENCE IN THE FRENCH MARKET WEPA France is investing while some competitors are selling or restructuring. Country Manager Christophe Dorin spoke to TWM Senior Editor Helen Morris. NICHE TISSUE... INDEPENDENCE, RECYCLED PAPER, RAPID RESPONSE, FLEXIBILITY, PERSONALISED AND INCREASINGLY GREEN PRODUCTS French manufacturer Papeco director general Emmanuel Coulon explains his smart circular economy concept at his Normandy mill. Report: TWM Senior Editor Helen Morris. Roll out the possibilities for your business. In the extremely capital-intensive tissue sector, both new and ongoing disruptors are changing the status quo. Skyrocketing pulp prices, increasing consolidation, the growth of e-commerce, and the potential explosion of tissue needs in underdeveloped countries are just some of the factors impacting the decisions you and your staff make every single day. The ability to leverage these changing dynamics as opportunities depends upon having access to the intelligence your business needs to chart a smart, forward-thinking path. This is where Fisher International comes in. We help suppliers, producers and investors in our industry make informed decisions faster, broadly, and more efficiently. Through the strategic use of business intelligence, backed by the expertise of respected thought leaders, we help you get to the heart of the knowledge you need to transform your business performance and reveal the best path for sustainable, profitable growth. Call us today. THE LONG AND THE SHORT OF IT… A CASE OF MORAL FIBRE Alexandra Stuthridge lives in Vancouver, Canada, and is the technical business manager of the BioProducts Institute (BPI), a globally-leading research cluster at the University of British Columbia (UBC). BPI is focused on advanced bio-based materials, chemicals and energy. CONVERTING TECHNICAL THEME: 2019 WILL BE RICH IN PROJECTS TO FIND THE LEADING EDGE In terms of optimal maintenance and process, analysing what the machines are telling us gives enormous added-value. TWM asked the world’s leading converting machinery suppliers – Fabio Perini, Futura, Gambini, ICM, Maflex, MTorres and PCMC – to explain their latest advances. DIGITAL SERVICE & SUPPORT FOR TISSUE, PAPER AND BOARD MILLS WORLDWIDE. The PrimeLinePerformance Center is located at the ANDRITZ headquarters in Graz, Austria and demonstrates an excellent combination of process, technology and product knowledge with digital services for PrimeLine tissue, paper, and board mills including stock preparation. 11 - 13 MARCH 2020 Miami Beach Convention Center, Miami Beach, FL, USA Held every even year, Tissue World Miami is the regionâ&#x20AC;&#x2122;s largest gathering of tissue manufacturers, converters, retailers and distributors, paper machinery makers, equipment providers and raw material suppliers. Boasting unrivalled learning and networking opportunities, every edition of the conference has always featured some of the most influential industry players such as Cascades, Kimberly-Clark, Essity and Sofidel. First took place in 2002, Tissue World Miami 2020 is Tissue Worldâ&#x20AC;&#x2122;s 10th edition in North America. Berti (Carlo): “Definitely the embossing area is one of the applications in which we are masters, even though we are developing important innovations also for the rewinding process. “However, a stunning breakthrough in tissue converting was born with Gambini’s revolutionary new technology “AirMill” which creates additional value in tissue converting as well as new opportunities in the paper mill process. AirMill anticipates the essence of innovation giving the paper characteristics that before could only be obtained in the paper mill. “Today, textured and structured paper provide very high quality but can only be produced in the paper mill, and requires large investments. However, starting from conventional paper (Dry Creped Tissue – DCT), AirMill technology creates a new type of paper with characteristics similar to textured paper whilst improving its bulk, softness, absorbency, strength and stability. “Gambini’s new AirMill represents a bridge between the paper mill and the converting activities. It ensures the optimisation of the process while keeping the properties of the paper and limiting the use of all types of resources: from economics to energy, chemicals and raw materials. It is a machine which is perfectly in line with the new sustainability trends.” Ulusoy: “In the last decade, ICM has created a very rare and unique unit which makes it possible to laminate 3ply paper with three embossing and two lamination applications in one unit. With this important innovation, it’s possible to emboss three and more ply tissue paper together to improve product quality. IF A TISSUE PRODUCER OR RETAILER CAN CLAIM TO USE SUSTAINABLE SOLUTIONS IN THE DELIVERY, OFTEN TOGETHER WITH SUSTAINABLE SOLUTIONS IN PRODUCTION AND THE WHOLE SUPPLY CHAIN, IT CAN IMPACT THE FINAL CONSUMER’S CHOICES. SUSTAINABLE TECHNOLOGICAL SOLUTIONS MAY BE DIFFICULT TO COMMUNICATE IN THE BULK BUSINESS, BUT IN THE LIMITED ON-LINE OCCASIONS IT CAN BE FOR INSTANCE DELIVERY BY BICYCLE – AND IT IS SURELY ADVERTISED. may be difficult to communicate in the bulk business, but in the limited on-line occasions it can be for instance delivery by bicycle – and it is surely advertised. Increased automation and interest in advanced technical solutions is clearly a significant trend in tissue delivery operations. Of the technologies generally seen as futuristic, automation already has the weight of evidence behind it. Retailers and logistic companies are achieving demonstrable results both in automation of transportation and in warehousing. As for automation of transport, the progress is likely to be largely in the software side of things rather than physical infrastructure of vehicles. Self-driving trucks and vans are still some way off, but software can be used to automatically manage things such as vehicle scheduling. Investments in automated warehouses and more and more automated order handling in tissue mills shorten delivery times, increase volume throughput and reduce costs. In the tissue sector several suppliers offer automation in the converting and warehouse areas. Their software platforms and technology guarantee the customer companies the means for optimal management of all logistic operations from the entry of raw material to the complete management of warehouse and shipments. This type of system has been applied by forerunner companies, such as for example Sofidel. production planning, warehousing and shipments. Digitalisation and automation may help to provide information to optimise production batch sizes, changeover policies, production sequencing etc. However, not only is the information that is available of importance, but also that the producer can use it the best way. Pöyry has services where the improvement potential in the supply chain operations is identified and the required changes to fill the performance gap are executed. The realisable Execution Gap (improvement potential) is comprised of both cost saving and throughput improvement opportunities. These improvements are available especially through management process changes. This Execution Gap consists of items focused on existing gaps in sales and customer service processes, production planning, as well as supply chain management. Savings of between 8-12% can be realised through sales and supply chain improvements, which typically translates to 0.8-1.8% EBIT, depending on project scope. The performance improvements feed directly to the bottom line or drive top line revenue growth. covers also the delivery costs. One benefit here is, however, the direct contact to the consumers and the information gained. In the AfH segment the most advanced solutions with sensors in washrooms provide data to both customer companies and the tissue supplier. The tissue supplier can use the data about washroom visitors and refill levels to predict demand development. Through this the sales and production planning and consequently the supply chain efficiency can be improved. These types of innovative ways to source and utilise data offer opportunities to automate and optimise supply chain operations. targeting to the e-purchase and leading to the page where the purchase can be made. Companies find the on-line connection to the clients important, and maintain mobile sites and mobile ​support for their clients. This works especially well for hygiene products, such as baby diapers where ratings and prices are eagerly followed and compared at the point of purchase. Also AfH on-line sales are supported by the brand owner in the on-line marketing through brand web-sites where there is a direct connection to the specific retailer’s or distributor’s site to order. The information flow the tissue producer gets through connections to the customers can improve their forecasting and production planning and that way the efficiency of the whole supply chain. The forerunners in digitalisation who get their systems ready first will have a competitive advantage until everybody else is on the same level. LOGISTICS IS ENTERING A NEW AGE OF EFFICIENCY – BY DESIGN AND NECESSITY Vittorio Cavirani, general manager, Elettric80, discusses harnessing the virtues of speed, accuracy, safety and traceability through E2E integration of Smart SW solutions. A TWM report. ELETTRIC80 AND BEMA HAVE BEEN COLLABORATING WITH ITALIAN TISSUE GIANT SOFIDEL FOR MANY YEARS. LUIGI LAZZARESCHI, CHIEF EXECUTIVE OF SOFIDEL GROUP, SAID: “THE BUSINESSES OF THE FUTURE WILL BE COMMITTED TO DELIVER DIRECTLY TO THE CONSUMER OR TO A LOCAL DISTRIBUTOR. TRANSIT TIMES, ANALYSIS OF AVAILABILITY, INFORMATION AND CUSTOMISATION OF GOODS, INCLUDING STORAGE METHODS, WILL BE THE FACTORS OF MAJOR CHANGE.” This article was written for TWM by Vittorio Cavirani, general manager, Elettric80. Early adopters are reaping the rewards now. In a world where speed to market is critical, future advances in AI will only further strengthen the technical leaders. By Paul W. Hill, business development manager, Reko Automation Division. mundane operator tasks and repetitive zero-value added work. Target areas for these new technologies and equipment range from; main product manufacturing assets, inflexible packaging equipment all the way to the raw material/finished goods warehousing and distribution. The latest Smart Factory Automation Equipment provides improved quality control through advanced vision inspections to further improve flexibility, productivity and efficiency. These developed technologies stimulate industry leaders to optimise their in-house processes along with tightening up the interfaces to their suppliers and customers. Smart Factory Robotics & Automation is revolutionising how manufactures produce their products. Emerging technologies are one of the keys to future CPG-Tissue product manufacturing success. Advanced factories use Industry 4.0 technologies to link together groups of automation cells that move plant-wide efficiency to a new step change level. These technologies improve quality and reduce costs by enabling predictive, corrective and adaptive processes and inter-processes. Recycling energy. Reducing emissions. Recovering costs. Introducing Reenergy+, a brand new autonomously-controlled integrated production model tailored to the demands of industry. The culmination of three decades of experience in plant design and manufacture by EIL, Reenergy+ is a revolutionary automatic system which delivers unprecedented energy savings through its hood-integrated gas turbine layout. Certified results include: -80% toxic gas emissions -35% energy costs +8% production efficiency 0% increase in gas consumption compared to conventional systems Reenergy+. Redefining the boundaries of production to develop new standards of efficiency and sustainability. COLLABORATIVE ROBOTS ARE ANOTHER TECHNOLOGY BEING IMPLEMENTED TO AUTOMATE MANY TASKS WITHOUT THE NEED FOR ROBOT GUARDING. HUMANMACHINE COLLABORATION AND SAFETY IS AT THE CORE OF THESE NEW TECHNOLOGIES. MOBILE ROBOT TECHNOLOGIES NOW PROVIDE NAVIGATION AND PLANNING SYSTEMS THAT PERMIT THE TRANSPORTATION OF PRODUCTS WITHOUT THE ERRATIC AND SOMETIMES DANGEROUS USE OF FORK LIFTS. This article was written for TWM by Paul W. Hill, business development manager, Reko Automation Division. TISSUE TAKES ON THE LOOMING ISSUE OF RAPID DECLINE IN P&W Costs concern as the supply and use of printing and writing papers - the primary source of recycled fibre for tissue/towel production – is declining rapidly as the digital world takes over. Bill Moore, president, Moore & Associates, addresses the key issues. Benefit from outstanding tissue paper production technology which is reliable over the entire life cycle of your paper machine. As a full-line supplier, we provide high-quality components and complete tissue machines, from financing to service. Interested? Find more information on our website. expectation that more and more of these grades will be recovered; however, their total available supply is fairly small. The growing brown napkin/towel business is based primarily on Old Corrugated Containers (OCC), but we are seeing increased usage of the RCP grade Mixed Paper also in these products. Brown products, particularly napkins, are being favoured by many cost conscious restaurant chains, not only because of price but also because of consumer preferences as to what they see as more ‘environmentally friendly’ products. While we are currently in a cycle bottom for OCC prices, going forward there is very large new demand for the grade as it is the fibre source of choice for corrugated box production. The good news is that the supply of corrugated boxes is growing, very much related to increased E-commerce consumer purchasing. Mixed Paper currently and for the foreseeable future is priced very low – averaging <$10 tonne in a number of countries. Both the OCC and Mixed Paper market slumps have been caused by the Chinese RCP import restrictions. China was the world’s largest Mixed Paper consuming country and their imports of the grade have virtually stopped. Mixed Paper has the lowest recovery rate of the major RCP grade categories, so supply is plentiful. The challenge is the mixed fibre and contaminants found in this ‘catch all’ grade.